The Chevy Cruze Hatchback is available now here at Chevrolet of Homewood. If you’re a new Cruze driver and you’re looking for ways to customize your car, you should check out our selection of genuine General Motors parts and accessories. You can personalize your Chevy Cruze Hatchback with the parts and accessories necessary to add some custom looks, or just add some function. Cargo Accessories: The Chevy Cruze Hatchabck offers a spacious interior and cargo area, and you can make it even more useful with a cargo net, a cargo tray, or a cargo mat to help keep your car clean and organized. Universal Tablet Holder: Rear seat passengers can take advantage of this unique universal tablet holder, so they can enjoy their own media, handsfree, wherever the ride takes you. 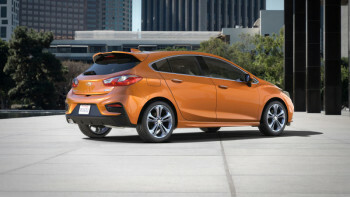 Ground Effects: The Cruze Hatchback can be had with unique ground-hugging, ground-effects body work for a sporty look like nothing else. Custom Grille: The Cruze Hatchback can be upgraded with a unique chrome grille insert that adds a bit of flash at the front of the car. Hood Protector and Splash Guards: You can add on these protective elements to keep road debris and splashes at bay. Door Sill Plates: You can add a unique stylish accent at the entry point of your vehicle with either illuminated or non-illuminated door sill plates. Floor Mats: The Cruze can be upgraded with a variety of floor mats, including replacement carpet, premium carpet, and premium all weather versions. Suspension Package: Do you want your Cruze to offer sportier and more precise handling? You can upgrade the Cruze with the suspension package. Wheel Locks: If you want to make sure your wheels stay put then add on a wheel lock package. You want those shiny alloy wheels to stay on your car, don’t you? Visit us at 18033 Halsted Street in Homewood, IL to learn more about Genuine Chevrolet and General Motors parts and accessories available now for the current Chevy Cruze Hatchback. We’re the local Calumet City area Chevy dealership, and we can help you find the right parts and accessories for your Chevy Cruze, so visit us today.